Nowadays, high-resolution videos are more and more popular among users. We’d like to buy HD or 4K movies, shoot high-quality videos by smartphone, GoPro, drones and car DVR. However, the video size is extremely large. So it may be a headache when you’d like to share these videos online, or storage card is out of box. Here is a good news that Digiarty is giving away WinX HD Video Converter Deluxe for its 12th Anniversary. It is a multifunctional video processing program that combines the functions of converter/compressor UHD-video, advanced video editor, online video downloader and more. Step 2. click “Grab now” , then hit “Get Free” button to download zip file. Step 3: Unzip the file, you will get a license code and setup file. Just install it and register with license. 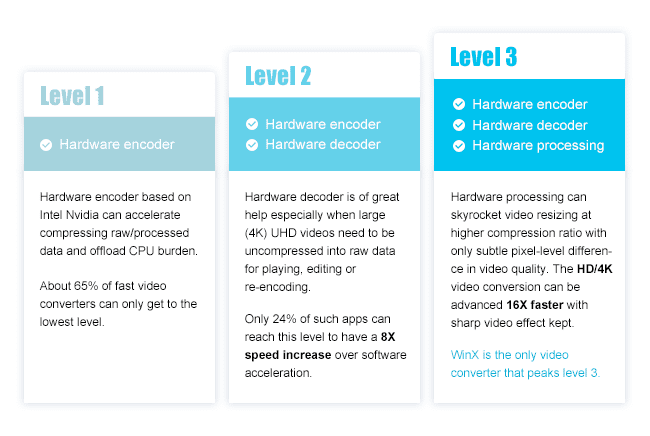 Newly updated with level-3 hardware acceleration techs, this HD video converter can maximize the capabilities of Intel QSV and Nvidia CUDA / NVENC for encoding, processing and decoding video. This means that the processing speed of the video will be greatly increased while preserving the best balance between video size and output quality. This is a very important one advantage of this tool, since most current converters do not have this feature. The application of hardware acceleration technology is necessary for processing 4K and HD video when you need compress video, convert it to another format, change its size or edit it. First, you will increase the speed of video processing. Secondly, save yourself from problems such as freezing the program, crashing in the process, slowing down during playback or overheating of the processor. If you are faced with the need to convert videos from one format to another, it can speedily do it for you. Built with 370 + video & audio codecs, this HD video converter enables you to convert among any video formats, e.g. MP4, AVI, FLV, AVC, MPEG, WMV, MOV, HD AVI, HD MPEG, M2TS, MKV, etc. 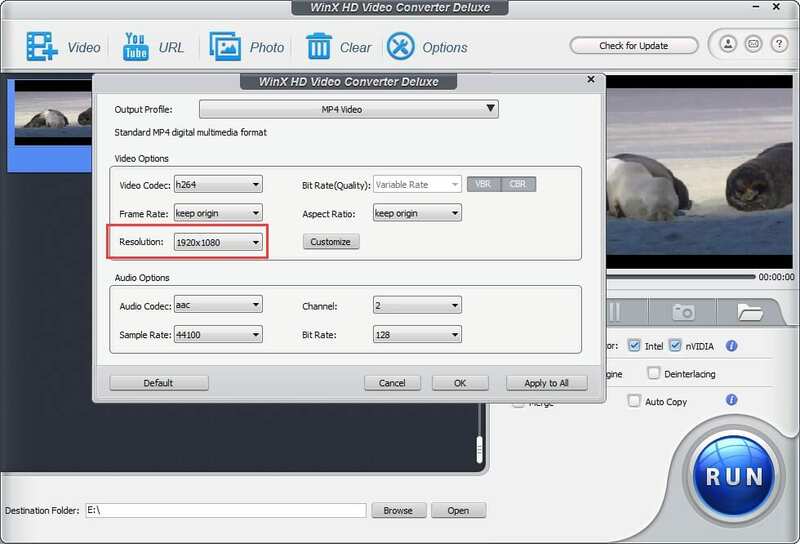 If you need to change the video format for viewing on iPhone, iPad, Apple TV, Huawei, Samsung, etc, just go with WinX HD Video Converter Deluxe which is featured with 410+ ready output profiles. If you want to download videos or music from YouTube, Facebook and other online sites. It totally supports 300+ online sites. If you want to extract only the audio track from the video clip and then convert it to the desired format. If you want to make and save multiple photos directly from the video. All those demands can be easily done by this program. In addition, this HD video converter also features the function to trim/crop/merge videos, add subtitles, change the name of the video output files, adjust the output quality of the video and audio parameters, adjust the frame rate and resolution. How to Convert HD/4K Videos with WinX HD Video Converter Deluxe? Here I take 4K to MP4 1080P video conversion for example. Run the program. Now you need to import your 4K video into it. You can add a movie using the “+” button, or simply drag and drop the video into the program window. Next you need to set the output format, let’s select MP4 videos and hit “ok. ” to select the resolution 1920 x 1080. Then click “OK” . 4. Now you only need to press the RUN button and wait for the process to finish. As you can see, the entire conversion process is quite simple. In order to download the program WinX HD Video Converter Deluxe for free, you need to visit this giveaway page.